The closing chapter of the automated supply ship's mission began early Sunday with its detachment from the space station's Harmony module. Grappled by the space station's robotic arm, the Dragon spacecraft was maneuvered from its berthing location to a release point about 30 feet beneath the complex. At the controls of the robot arm inside the space station's cupola module, astronaut Steve Swanson gave the command to release the 12-foot-diameter spaceship at 9:26 a.m. EDT (1326 GMT) to begin the trip back to Earth. Swanson and cosmonaut Alexander Skvortsov monitored the Dragon's departure as a series of rocket firings placed the spacecraft on course to a safe distance from the space station. Sunday's departure was the first time a spacecraft had been released from the station's robotic arm with only one U.S. astronaut present on the outpost. "Thanks to everybody who worked this Dragon mission," Swanson radioed from the space station. "It went very well, and I appreciate that tremendously. It's also very nice to have a vehicle that can take your science equipment, and maybe some day even humans, back to Earth. Thank you all." The gumdrop-shaped Dragon space capsule was loaded with about 1.7 tons of cargo, scientific research samples and other gear for the return to Earth. The items coming back to Earth with SpaceX's Dragon spacecraft include freezers and refrigerated bags containing blood and urine samples, plus experiments which examined drug-resistant bacteria in space, DNA damage to human cells in microgravity and the use of sustainable agriculture as a food source for long-duration space crews. A spacesuit in need of repair is also strapped inside the Dragon cargo craft, along with water samples NASA says it needs to complete an investigation into why an astronaut's helmet filled with water during a spacewalk last year. "The space station is our springboard to deep space and the science samples returned to Earth are critical to improving our knowledge of how space affects humans who live and work there for long durations," said William Gerstenmaier, associate administrator for human exploration and operations. "Now that Dragon has returned, scientists can complete their analyses, so we can see how results may impact future human space exploration or provide direct benefits to people on Earth." Ground controllers at SpaceX's headquarters in Hawthorne, Calif., prepared the spaceship for re-entry by closing a door over Dragon's rendezvous sensors and grapple fixture. A deorbit burn using the craft's Draco rocket engines began around 2:12 p.m. EDT (1812 GMT), according to SpaceX, reducing the height of the craft's perigee, or low point in its orbit, to allow it to drop into the atmosphere for a scorching re-entry. The ship jettisoned an unpressurized trunk module and its electricity-generating solar panels a few minutes later before diving into the atmosphere heading northwest-to-southeast over the Pacific Ocean. A specialized ablative heat shield developed by NASA and SpaceX shielded the Dragon spacecraft from temperatures reaching up to 3,000 degrees Fahrenheit on its hypersonic approach to a landing zone about 310 miles off the coast of Baja California. 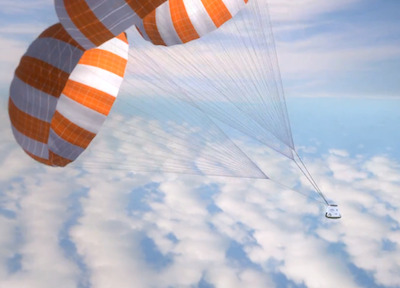 After deploying three 116-foot-diameter parachutes, the Dragon capsule gently descended into the eastern Pacific Ocean at 3:05 p.m. EDT (1905 GMT). SpaceX technicians were on standby on boats near the landing zone to recover the spacecraft and ferry it to port in Long Beach, Calif., where it is due to arrive by early Tuesday. SpaceX will hand over time-sensitive cargo inside the capsule to NASA once the spacecraft arrives at Long Beach. 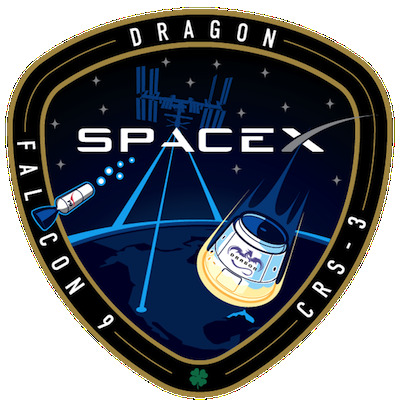 The company plans to transport the Dragon to SpaceX's test facility in McGregor, Texas, for post-flight processing and safing. The commercially-built Dragon logistics transporter was developed in a public-private partnership between NASA and SpaceX, which has a $1.6 billion contract for 12 cargo missions to the space station through 2016. The mission that ended Sunday was the third of the 12 resupply missions contracted to SpaceX. The Dragon spacecraft arrived at the International Space Station on April 20 after a two-day pursuit of the complex following its April 18 liftoff on a Falcon 9 rocket from Cape Canaveral, Fla. The cargo craft delivered 4,600 pounds of supplies, logistics and experiments, which were unloaded from Dragon's pressurized compartment by astronauts. Two experimental packages mounted inside Dragon's external trunk section were removed by Dextre, the station's robotic handyman. Ground controllers guided Dextre and the robotic arm to place the experiment boxes on their new homes outside the space station. One of the experiments is a high-definition camera suite, which is streaming live video footage of Earth online for viewing by the public. The other payload is an optical laser communications terminal to demonstrate high-bandwidth data transfers between the space station and a ground antenna on Earth. The space station's crew installed approximately 3,563 pounds of cargo into the Dragon spacecraft in place of the fresh supplies it took to the complex. The items tagged for return to Earth included more than 1,600 pounds of science and research hardware, nearly 1,200 pounds of crew and vehicle supplies, and 627 pounds of spacewalk tools. The Dragon is the only spacecraft in the space station's fleet of visiting vehicles capable of returning significant sums of equipment to Earth. The Soyuz crew vehicle has limited capacity to bring cargo back to Earth, while other resupply freighters flown by Russia, Japan, the European Space Agency and U.S.-based Orbital Sciences Corp. dispose of trash in destructive falls back into the atmosphere at the ends of their delivery missions. SpaceX's next resupply flight to the space station is set for launch in August, while a fresh three-man crew of U.S., Russian and German space fliers is readying for liftoff May 28 on a Soyuz spacecraft from the Baikonur Cosmodrome in Kazakhstan.